Approaching research for an article on a specialized subject is as important as writing the article itself. When it comes to research where multiple sources, dates, even identical titles are involved, checking and re-checking the facts must be done while making notes for the article to be written. 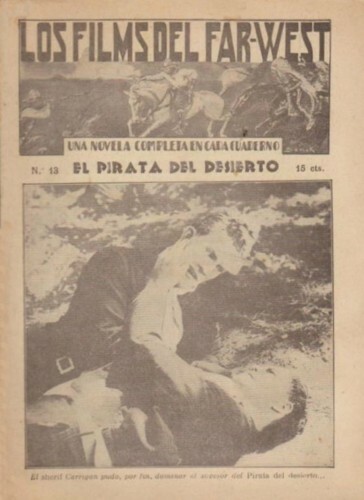 For example, if research is being conducted on a silent film actor who made a silent film – and later on a talkie – bearing the same title, and a second actor made a silent film of the same title one year later after the first actor (it has actually happened! ), confusion can arise. Likewise, knowing where to begin research on the silent film actor is important too. Did the actor in question get his start in live theatre, or in films? Was the actor credited under more than one name? This is just scratching the surface of the actor’s career work, not even delving into personal details such as birth date and birth location which can also at times conflict if there is no consistency of information across various sources. Researching a silent film actor need not be confined to seeking out the best local university libraries and physically visiting them, poring over large texts for hours at a table. Thanks to the Internet, websites such as IMDB and IBDB (Internet Broadway Database) are usually helpful with research although at times can be incomplete (it has been said there is no such thing as a “complete acting credits record” in IMDB). However, they are a good start in becoming familiar with the work of the person being researched. Archives.org or Lantern.mediahist.org are two top websites containing primary sources for silent film research. Sources like Motion Picture Daily News and Motion Picture Magazine often contain information such as press releases, rare photo shots, film rankings and release dates. Even more daring stunts would follow in the next handful of [Tom] Tyler’s silent films. 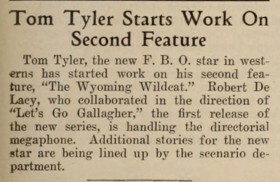 In “The Wyoming Wildcat” (Motion Picture News, Nov./Dec. 1925), Tom leaped off the top of a steep cliff into a rapid whirlpool below to rescue his love object, played by Virginia Southern. He managed to stay afloat of the watery trap, with the girl safely tucked under his strong arms, as he swam to shore and revived her, eventually winning her hand at the end of the story. Once the article is completed, do not throw out the researched material. Chances are it can be referenced again in the future for another article with a different slant.